Autumn is in full swing on Kebler Pass as a large storm arrives in the West Elk Mountains. Both the Aspens and the Scrub Oak are at peak but the heavy rain and snow with the arriving front will strip most of the leaves from the forest. 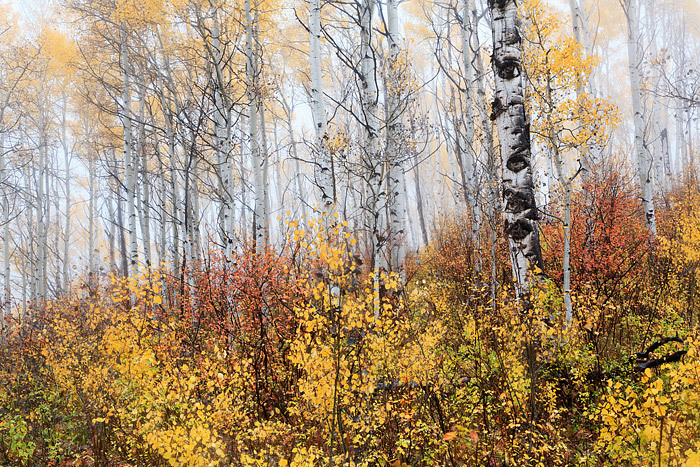 While photographing this scene outside of Crested Butte, fog swirled in and out of the forest and rain pelted the photographer. Colorado has some of the best fall color in the western United States, but scenes such as these may only last a brief time as the transition to Winter will occur quickly. Photo © copyright by Thomas Mangan.